On September 9, 1927, Martin Hector leased a quarter-section of land at the northwest corner of Fargo to the city for five years at $1 per year. 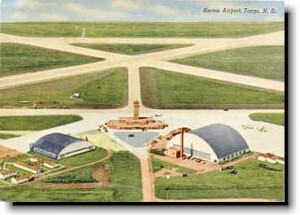 On April 9, 1931, Hector paved the way for Fargo’s airport with his outright gift of the land. In later years, Hector and daughter-in-law, Mrs. Fred M. (Margaret) Hector, donated several more parcels totaling almost 50 acres. This land is part of the present airport property, along with acreage purchased from many adjacent landowners. Although the first successful airplane flight in Fargo took place in 1911, the flight occurred at the old Fairgrounds. Northwest Airlines (founded at what is now the Minneapolis-St. Paul International Airport on September 1, 1926) began scheduled weekly flights into Fargo on February 1, 1928. This was a Minneapolis to Winnipeg flight with a stop in Fargo. Opposition from the Canadian government resulted in suspended service after three months. It was February 3, 1931, when Northwest Airways began its first passenger service to Fargo. A “giant” six passenger Hamilton Metal plane settled down on the new Fargo Airport to inaugurate air service from Minneapolis to Grand Forks and then on to Winnipeg. The commemorative envelope is below. 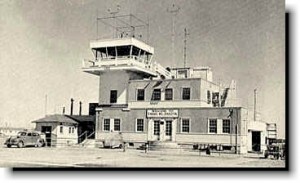 On May 27, 1931, Fargo’s Municipal Airport, Hector Field, was dedicated. Brief showers failed to deter more than 5,000 Fargo residents as they came to see the dedication. The Forum reported that the roads to the airport were “choked” with cars and planes zoomed overhead. Hinton, on a mission to promote civil aviation for the Exchange Clubs of the U.S., spoke about the history of aviation. The first 20 pilots landing in Fargo between 10 and 11 a.m. received cash prizes. First to arrive was J.M. Bacon of Grand Forks, who reportedly landed by clearing a fence by only 5 feet! He entertained the crowds with stunt flying throughout the day. Other pilots thrilled the crowd, but three Navy fliers from Minneapolis were reported as the best fliers of the day with their precision formation flying. Drum and bugle corps and bands from the AOUW lodge, NDAC, and high and military groups performed for the dedication. Squads from the local National Guard unit marched over the field. The dedication ended with a street dance at First Avenue between Roberts Street and Broadway. Pictured in two postcards below is the original Hector Field Terminal. The Christmas card depicts the men and women who worked at the facility. Their names (clockwise from the upper right) are Lloyd Jensen, Cliff Gohdes, Ken Diehl, Celia Fattore, Bill Harrison, Bob Wall, Duane Jennings, Man Johnson, John Ewald and Wally Kuhr. 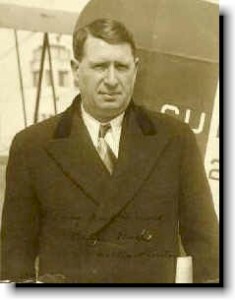 The photograph below was taken in 1938, seven years after the dedication of Hector Field. This picture was taken in front of the terminal building of a Northwest Boeing 377 Stratocruiser. 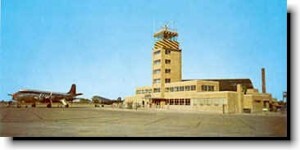 In 1953, a new terminal and administration building was built at a cost of $400,000. When the city built a new terminal building in 1986, this building became an aviation office complex. The Civil Air Patrol Headquarters are also found here. 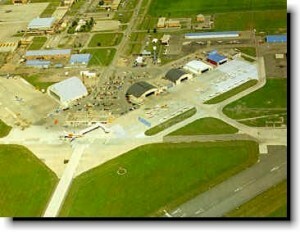 Pictured below are two aerial views of Hector Airport during this period. The present terminal was built in 1986. With its construction, the terminal facility moved from the southeast corner of the airport grounds to the west central area. In 1982, Hector Field became Hector International Airport and U. S. Customs opened an office on the field in 1985. In 2013 they moved into their new facility on the north general aviation ramp. Hector International Airport completed the passenger terminal expansion/update project October 2008. The project updated the existing terminal building, added a fifth gate and third baggage claim, and expanded the security checkpoint area. Click here to see pictures of the completed project. Today, American, Allegiant, Delta, Frontier and United serve Hector International Airport with nonstop service to 10 cities. Delta offers flights to Minneapolis and Atlanta*. United offers flights to Chicago O’Hare and Denver. American operates flights to Chicago and Dallas. Allegiant operates flights to Las Vegas, Phoenix-Mesa, Los Angeles*, Tampa* and Orlando-Sanford*. Frontier operated flights to Denver. 2014 was the busiest year for total passengers for the airport. Almost 900,000 total passengers either enplaned or deplaned at Hector International Airport. For more news about Hector International Airport, please visit the news section. Thanks to Ben Burns at Wayne State University and www.fargo-history.com for this information.